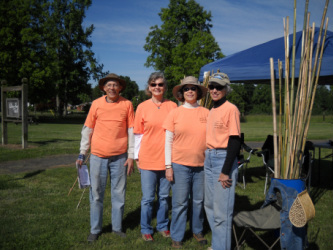 The Friends of Chinqua-Penn Walking Trail is dedicated to improving, maintaining, and promoting the Chinqua-Penn Walking Trail for the public to use to improve their health, increase their knowledge of local natural and cultural history, expose them to good agricultural practices, and provide them a pleasant recreational opportunity. 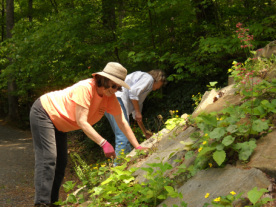 If you are interested in being a Friend of the Trail, we encourage you to attend one of the monthly meetings. Usually the Friends meet at the Upper Piedmont Research Station office, 1944 Wentworth Street, Reidsville. Meetings are generally held the last Thursday of the month at either noon (quarterly) or 7:00 p.m. Notice of the next meeting time and place will be posted at the trailhead in the bulletin board or the kiosk. To become a member, simply attend a meeting or workday and sign up! There are no dues, but donations are always welcome. 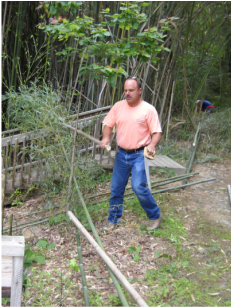 Every penny goes toward trail improvements. 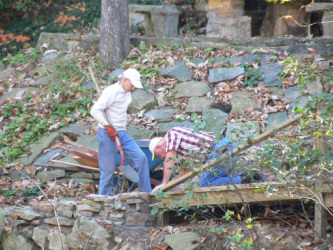 Lee and George Templeton, and Mike Vaughan, loading debris from a recent trail workday.